Why turn Who Killed Kennedy into an eBook? Well, it has been out of print for at least five or six years. The book was originally published by Virgin as an off-shoot from its regular lines of New Adventures and Missing Adventures novels. Who Killed Kennedy was to be a side-step, a fresh perspective on familiar events. But not long after it hit the shelves, Virgin lost its licence from the BBC to published new Doctor Who novels. Who Killed Kennedy had been selling well enough for me to get a royalty cheque but was now doomed to disappear with the rest of the Virgin line. Happily, the BBC's online Doctor Who site has begun reprinting some of those out-of-print tomes as eBook, with notes and commentary from the authors. During exchanges of emails with NZDWFC supremo Paul Scoones I mentioned rescuing my original text files for Who Killed Kennedy while recovering data from my old Apple Performa. Wouldn't it be nice to give Who Killed Kennedy the eBook treatment? Quick as a flash Paul offered to reprint my first Doctor Who novel on the NZDWFC website. Even better, he was willing to go along with my idea of offering two versions - the original text from my old computer, and an alternate version. When to do it? Well, 22 November 2003 would be the 40th anniversary of JFK's assassination. Link it to that and the eBook could also be a 40th birthday present for Doctor Who fans in New Zealand (and other countries, the web knowing few boundaries). In 1993 Virgin Publishing was looking to expand its fiction output, which at that time consisted of Doctor Who and erotica (books to be read one-handed, as the writer's guide described them). It was announced that the British comics character Judge Dredd was being made into a film for release in 1995, so Virgin acquired the rights to publish original Dredd novels. I was editor of the Judge Dredd Megazine at the time and put myself forward as a potential author. To cut a long story short, I wrote three Dredd novels during 1993 and 1994. But what I really wanted to do was write a Doctor Who novel. I had penned The Pirate Planet novelisation for TSV Books before emigrating to Britain and wanted to write an officially licensed Doctor Who tome. Alas, my inspiration did not match my enthusiasm and Virgin's Doctor Who editor Rebecca (Bex) Levene kept rejecting my proposals. The usual sort of thing - Amish settlers on distant planet battle super-evolved sharks, peace conferences between Earth and Draconia set on a zeppelin above a dying planet. Crap, in other words. Around this time Virgin was looking to acquire the licence to publish novels based on Marvel Comics characters like Spiderman and the X-Men. As a result, Bex and the others were reading a lot of Marvel comics. Probably one of the best titles from that time was Marvels, a four-issue fully-painted mini-series by Kurt Busiek and Alex Ross. This followed the evolution of the Marvel superhero universe, but as seen by a photo-journalist. Marvels was a revelation, because it showed the ordinary outsider's perspective on extraordinary events. What if the same approach could be applied to Doctor Who? Bex and I spent a lot of time talking about this idea, how to make it work. Conspiracy theories and The X-Files were in vogue at the time, adding another element to the mix. If an outsider looked at the events of stories from the UNIT era, what would they see? A massive cover-up to conceal what was really happening. Suddenly the Doctor ceases to be the hero and becomes a shadowy, mysterious figure with many different faces. Another inspiration was non-fiction books like Carlos: Hunt for the Jackal by David Yallop, best known in NZ for writing Beyond Reasonable Doubt which helped get Arthur Allan Thomas's murder conviction overturned. Yallop's works were often presented in a breathless first person narrative, where the author's quest becomes the story. Title: ENIGMA - The story of one man's search to find the Doctor. For three decades a strange individual has appeared at major disasters just before they happen, as if he has some fore-knowledge of them. Or perhaps he is causing the tragedies himself? During the Post Office Tower crisis of 1966, reporter Jack Marshall notices a person on the sidelines who seems unafraid, even bemused by the events taking place in central London. But when Jack later tries to discover the identity of this stranger, nobody seemed to know (or be willing to say) anything about him - except that he was called the Doctor. At the time, Jack thought little of it. But, a few months later, the journalist encounters another unusual individual, this time while following a lead about passengers on charter flights going missing at Gatwick. It is only afterwards that Jack hears the person's name - the Doctor! Surely this cannot be the same person? Jack does further investigating and discovers earlier cases involving individuals known only as the Doctor - a top secret Army file known as the Shoreditch Incident from 1963; the loss of a satellite in Wales in 1959; and even mention of a man called the Doctor is a series of disappearances of women investigated by the London police in 1889, which some believed where the work of the Ripper. The controlling idea behind this proposal is to create a story that gives an outsiders perspective to the monumentous events that have involved the Doctor on Earth in our time. For example, what effect did the evacuation of London in 1975 (for 'Invasion of the Dinosaurs') have on ordinary people? What about rumours which swept the art world in 1979 that the Mona Lisa hanging in the Louvre was actually a fake? And how did authorities explain away the appearance of a sea monster in the Thames during a world peace conference in London? Investigative journalist Jack Marshall acts as everyman for the story, pursuing leads and fighting red tape to try and discover the truth about the Doctor. At first he believes the 'Doctor' is just a code-name used by special operatives, thus explaining the wildly different appearances. Then, as evidence mounts up, he is forced to challenge his own beliefs, his own prejudices. Finally, the tragic death of Jack's estranged daughter forces him to face reality, and realise how his obsession has taken over his life. Three years of painstaking research have revealed the shocking facts in this book, the truth about who really runs Britain and the world. About who makes decisions and who wields real power. About the terrifying actions carried out in the name of the 'common good', but concealed from the public for reasons of 'international security'. The reality of what has happened in the last three years is more frightening than you can ever imagine. Read the following statements and decide for yourself - are they just wild lies or could they possibly be true? Billions of pounds of taxpayers' money has been spent on top secret scientific research projects that cost the lives of more than a dozen people. These projects were later abandoned without explanation. Twice the world has been pushed to the brink of nuclear war by an evil terrorist who was tried in secret, incarcerated at his own special prison only to escape and currently remains at large. Mind control experiments have been carried out on inmates at British prisons without their consent. The experiments led to a full-scale riot and the deaths of more than thirty people. More than a hundred people in five nations were killed by a deadly virus, which has been traced back to a secret nuclear research centre. But the public was never told about this modern-day plague. Dozens of soldiers and civilians are kept at a secret asylum known only as 'The Icehouse'. Some have been driven insane by events they saw, others are being held against their will to stop them speaking out. One organisation links all these incidents together - UNIT, the United Nations Intelligence Taskforce. It is a secret military force, funded by the taxpayer but accountable to no-one. Inside this book we reveal the truth about UNIT, its secret agenda and the special agents who work for it while posing as 'scientific advisers'. The leader of UNIT in Britain has never been interviewed or identified in print - until now. For years the public have been kept in the dark - now the shocking truth can be told! This is a pseudo-conspiracy book, written in the style of THE HOLY BLOOD & THE HOLY GRAIL or THE HUNT FOR THE JACKAL. But unlike those factual works, this proposal is for a fictional investigative journalism study of UNIT during the Pertwee Era. The book aims to create a fresh perspective on the televised stories of that time, by studying them from the point of view of an outsider - in this case, an investigative journalist. Instead of rehashing the minutia of broadcast Third Doctor stories, the book would look at the consequences of those stories, how they affected the public and one person in particular. By now Bex was becoming very enthusiastic about the proposal but felt it still needed work. For instance, the book didn't have an ending - it began with Spearhead from Space and continued through the first two Pertwee season but ground to a halt circa Day of the Daleks. Also, it was obvious the book was not part of the New Adventures but the scope of the period covered meant it did not fit snugly into the Missing Adventures format. Bex and I both wanted the novel to be published in the same style as the conspiracy tomes it was parodying, with big type on the cover and with a selection of blurry black and white photos in the centre pages. Ideally it would not even have the Doctor Who logo on the cover. A new idea was suggested by Virgin. In 1993 there had been a rash of books to coincide with the 30th anniversary of the assassination of US President John F Kennedy on 22 November, and then with the 30th anniversary of the first Doctor Who episode being broadcast on 23 November. Apparently it was running joke in Virgin that a book which hit both markets should be a bestseller. Why not use the JFK conspiracy to provide a hook on which to hang my Doctor Who proposal? To be honest, I didn't have an ending. It was fast becoming obvious the finale of the book would have to be a confrontation between the reporter, the Third Doctor and the Master, as this trio were the heart of the proposed novel. I recall talking with Bex about basing the ending around events that would culminate in the regeneration of the Delgado Master. But instead the JFK idea took hold and I agreed to incorporate into my proposal. By now I had been working on the pitch for six months and was desperate to get it commissioned. President John F. Kennedy was assassinated in Dallas, Texas on November 22, 1963. Since that tragic day more than 30 years ago, hundreds of books, documentaries and films have tried to discover the truth about who pulled the trigger and the cover-up that followed. Now, the publication of this volume reveals shocking new information about the assassination, the real reasons why the President of the United States had to die and previously undisclosed classified information about an incredible plan to save the man known as JFK! The stunning revelations involve an ultra-secret military force disguised as a minor off-shoot of the United Nations, an international terrorist who has twice pushed the world to the verge of nuclear war during the 1970s and a massive cover-up involving the governments of every superpower. For more than three decades the public has been fed lies, half-truths and misinformation. For too long we have been kept in the dark. Now - despite Government attempts to halt the publication of this volume - the complete, shocking story can be told. Read the book they tried to ban! JAMES STEVENS was an award-winning Fleet Street journalist in the late 1960s and early 1970s. But he was publicly vilified after the infamous 'Bad Science' documentary was screened on BBC3. Now he tells the truth about that incident and how to lead to this incredible new revelations. DAVID BISHOP is an award-winning journalist. He has written three novels but describes this book as proof that reality is infinitely more terrifying or thought-provoking than any work of fiction. At last I hit pay-dirt and in May 1995 signed a contract to write Who Killed Kennedy. The book was to be between 75,000 and 95,000 words, to be delivered by the end of September that year and I would be paid two thousand pounds as an advance against potential future royalties. Best of all, I would have an official Doctor Who novel published with my name on the cover! Having added JFK to the mix, I now had to research him and his assassination along with all the other Doctor Who and real world elements. There was the problem of UNIT dating to resolve and dozens of other elements to determine. All my previous novels had been written in ten weeks while I held down a fulltime job as a comics editor. For reasons surpassing understanding I waited until I only had ten weeks left to deadline before starting Who Killed Kennedy. Writers, they're a superstitious lot. I did have one valid excuse - the summer of 1995 was madness at my job with the launch of the Judge Dredd film starring Sylvester Stallone and all the attendant craziness. I was editing and designing three titles simultaneously without an assistant. Where I found the time to write Who Killed Kennedy, I'll never know, but somehow I managed it. Mostly I wrote on days off or when my wife was out of the flat - I've never been able to write fiction while there's somebody else in the house. For every book I write, I find a single CD to act as my background noise. Usually it's a film soundtrack, such as Michael Nyman's music for The Piano. Having found the perfect music to accompany the book, I put the CD on continuous play and it just goes round and round and round. For Who Killed Kennedy, the soundtrack was Sneakers by James Horner. I must have listened to it 200 times while writing that book. Judging by the dates on my computer files, the manuscript was delivered to Virgin at the end of October 1995, with publication scheduled for April 1996. Alas, the concept of having eight pages of blurry black and white photos in the middle of the book was dropped for reasons of expense. Virgin's sales team decided the Doctor Who logo had to appear on the book, otherwise nobody might buy it. Choosing what was to go on the cover provoking many hours of debate, with suggestions of having the TARDIS sat on the infamous grassy knoll in Dallas (a nice idea but not a scene that was in the book). 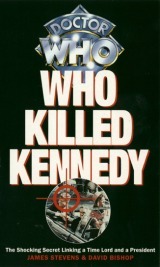 Who Killed Kennedy was published in 1996 just as Virgin lost its Doctor Who licence. The book was well received, getting decent reviews in SFX magazine and from Doctor Who Magazine. I got a few nice comments at the monthly gathering of Doctor Who fans at the Fitzroy Tavern in London, but that was the end of the book for me. I wasn't online at the time so had no idea of general fan reaction to Who Killed Kennedy. According to my royalty statements, Virgin sold just over 13,000 copies of the book. After clearing my advance, the company paid me just under a thousand pounds in royalties. In December 1995 I had been made editor of weekly science fiction comic 2000 AD and just didn't have the creative energy to be writing novels in my spare time. It seemed Who Killed Kennedy would remain my first and last official effort. One day I bumped into Paul Cornell in the basement of London's Forbidden Planet and he told me Who Killed Kennedy was king of the miscellaneous books. I just looked at him blankly. Eventually he succeeded in explaining to me about the online rankings of Doctor Who novels. Who Killed Kennedy did not fit the usual categories, so it had been lumped into the 'Miscellaneous' section with anthology titles like Decalog. Happily, there seemed to be a lot of people who remembered Who Killed Kennedy fondly and the book was the highest ranked in its section.